T-Zero is a unique process control program that facilitates automated design and execution of command, control, test, and monitoring activities. It features visualization of the operations process itself coupled with automated coordination of group activities. 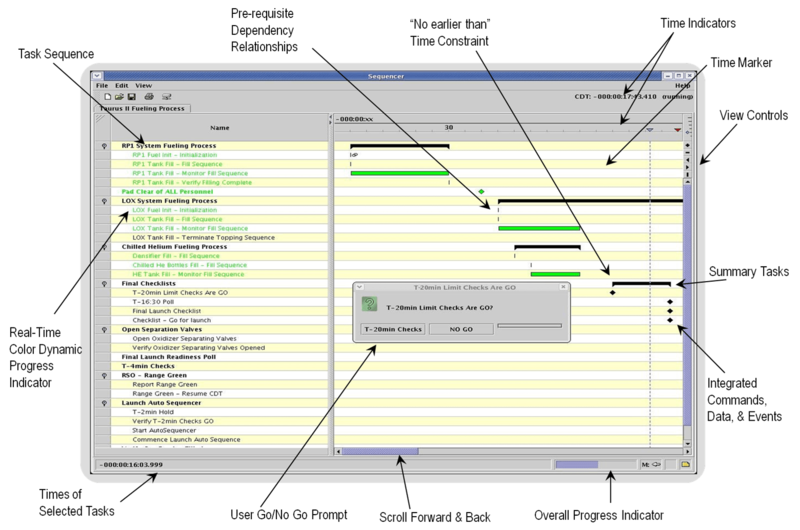 The software provides a visual, role-based interactive timeline built on the real-time data processing power of the Command and Control Toolkit™ (CCTK). T-Zero is the perfect automation solution for labor -intensive procedural activities: improving process organization, repeatability, and freeing operations staff from tedious task details to focus on strategic operational objectives. T-Zero combines aspects of workflow control and real-time process control with a collaborative graphical user interface that acts as a context sensitive portal for role players to interact with processes and other role players. It makes processes and procedures executable, and capable of being instrumented with human, ands systems input: while at the same time, increasing situational awareness and proving analytical information important to process improvement. T-Zero’s multi-platform java client presents a visual timeline with interactive symbols for process tasks, providing real-time status, progress indication, and human dialogue interaction facilitating group decisions. T- Zero’s real-time process sequencing engine executes process scripts that are created off- line using the simple T-Zero XML Process Description Language (PDL). The PDL describes the sequences of tasks, task entry constraints, and execution behavior. The engine executes the PDL, resolving tasks state and order of execution by continuously evaluating real-time data from CCTK, human users, and other tasks/ processes state. The engine also broadcasts real-time progress updates to participate clients over standard TCP/IP networks to enable distributed operations.